The Web Tab (Shown below) carries out two different functions. First it provides for Actions associated with the entire show. These are actions associated with a mouse click on any part of the show and on actions to be executed when the show is complete. 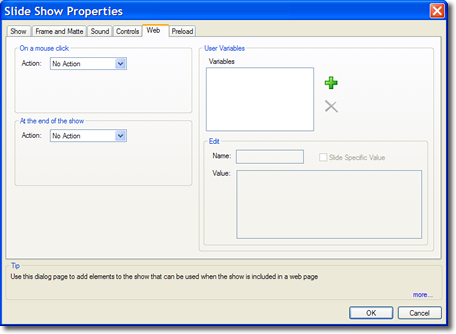 The Web tab (User Variable panel) also is used to define user variables for use in text labels. Note: The web tab is is only found in the WD version. The On a mouse click panel defines the action that occurs if any part of the show is clicked on. In effect the entire show is an active link if a mouse click action is defined. Click here for a full description of all available actions. The At the end of the show panel defines the action that is taken when the show ends. The same choice of actions are available in both panels. 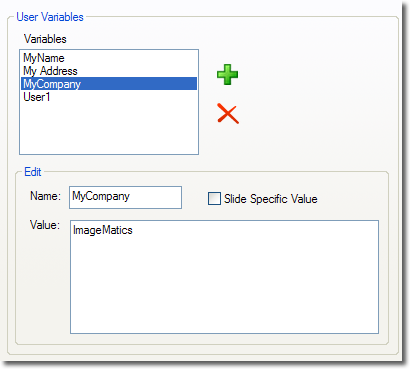 The User Variable panel provides for the creation and definition of Variables (Click here for a description of Variables). A Variable by default is defined to have a value that is available and the same to all slides in the show. The User Variable panel is shown below. To create a new variable click on the green "Plus" sign. A name like User1 will appear in the Name field of the edit Panel. Rename this with a descriptive name. A Variable will apply to the entire show (global) if the Slide Specific Value box is left un checked. If a Global variable is defined then its value (how it will appear) is selected in the Value text box. A value may be any alpha numeric string, a single word or several paragraphs. In the illustration above three Global Variables are defined. MyName, MyAddress and Mycompany. we show the display value of MyComapny to be ImageMatics as shown in the value text box. The created User Variables will now be found in the Variables pull down list associated with text box creation under Text and Graphics. Clicking on the Slide Specific Value box defines a variable as having its value locally defined in each slide (see Web Tab under Slide Properties). Slide specific variables have no value assigned in this Tab. A slide specific value might be a price, a measurement a product name or a description associated with individual slides.